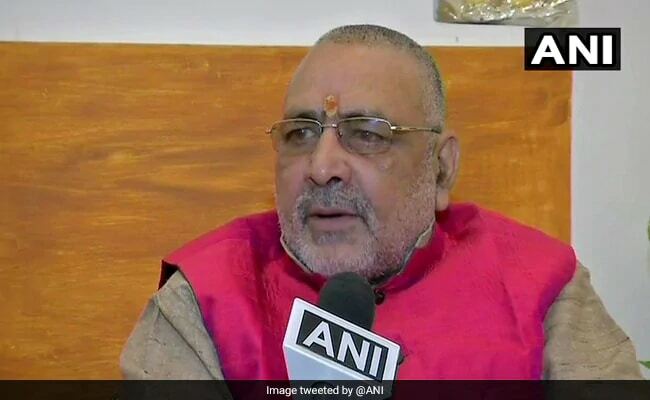 Giriraj Singh is expected to file nomination papers on April 9 in Begusarai. Taking an indirect swipe at CPI candidate Kanhaiya Kumar, Union Minister Giriraj Singh, who will contest for the BJP from Bihar's Begusarai constituency, on Saturday said his fight is against "desh ka gaddar" (traitor). Addressing the leaders and workers of the National Democratic Alliance (NDA) in Begusarai, Mr Singh said: "I am sure that people of Begusarai will not only defeat them (traitors) but also give them a befitting reply." After expressing his unhappiness and reluctance over being given ticket from Begusarai and not Nawada, his traditional constituency, Mr Singh has now been camping there, meeting party workers and supporters in the district.